By Stephanie Costello | May 7, 2013. While it’s not quite time to relinquish the overcoat and scarf there’s no harm in a little lazy day summer festival daydreaming. This year marks a turning point in the party calendar with more festivals in Ireland than any discerning punter could shake an overpriced pint at. The increased popularity of the music festival in lieu of an actual holiday around these parts sees more competitively priced events offering some long overdue sonic diversity. It’s the era of the boutique festival, a small shindig attracting colorful crowds not interested in one major headliner but rather an overall experience. The Body and Soul festival fits the bill. Premiering at Electric Picnic a few years ago, the arena soon became the preferred destination of the chilled out ambient crew.The organisers are back for a third time this year and don’t need any luck considering the event has sold out since its inception. Expect a line-up as diverse as a ladies’ knicker drawer, from Beyonce’s soulful sister Solange to Nick Cave and The Bad Seeds. If that doesn’t sound too appealing, fret not, a host of spoken word poets or a lively yoga session in a surreal setting may whet your pallet. 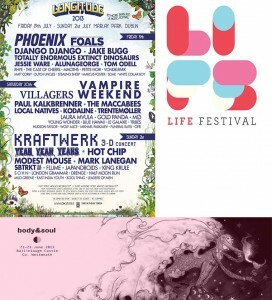 The tickets are reasonably priced at €139 and if camping just ain’t your thing, day passes are available at €55. It all kicks off on June 21−23 in Co. Westmeath. If dance music is more up your neon-paved street, then Life Festival is just the ticket, showcasing the very best and brightest of homegrown talent from Toby Karr, Mmoths, Frank B and Raglans. These lads have generated good vibrations internationally, so expect mind shattering tremors come May 24-26. As if that wasn’t enough, musicophile and Frenchman Laurent Garnier brings his diverse mélange of deep house, techno and jazz to the Co. Westmeath idyll. Tickets are €136 if booked now and €160 on the gate. So, festivals are great and all, I hear you say, but what about the more refined among us who just don’t do camping? Well, luckily enough, Longitude in Marley Park’s got your back. Cast your tents aside because there’ll be no pitching problems from the powerhouse trio Yeah Yeah Yeah’s when Karen O takes the stage. Headlined by German techno legends Kraftwerk and the eternally preened Vampire Weekend, Longitude runs from July 19-21.